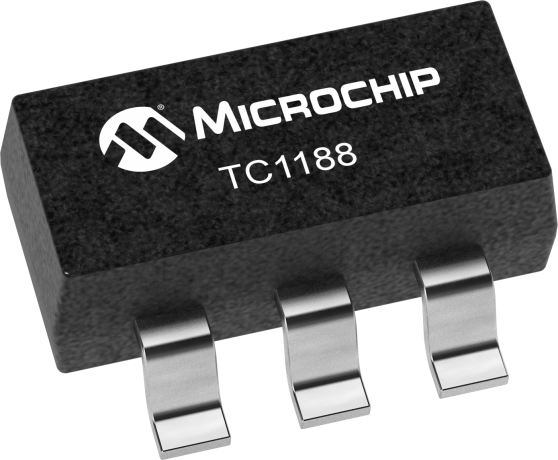 Delivering up to 120mA, the TC1188 and TC1189 are fixed output, low-dropout linear regulators that operate from a +2.5V to +6.0V input range. The 50µA supply current remains independent of load, making these devices ideal for battery-operated portable equipment. The output of the TC1188/1189 is preset at 3.15V, 2.84V, 2.80V or 1.80V. (Other output voltage options are available. contact Microchip Technology for more information.) In addition to low-power shutdown, short-circuit protection, and thermal shutdown protection, the TC1189 includes an auto-discharge function that actively discharges the output voltage to ground when the device is in shutdown mode. Both devices are pin-compatible with the Maxim MAX8863/8864 LDOs and are available in SOT-23-5 pack-ages.